We were in a maintenance period at the company’s dock in Quebec City, doing a fair bit of heavy stuff, things were moving fast and the pieces were big. The pain started just before ten in the morning, in my right elbow, not quite at the tip, but very near it; I could feel the exact spot where the pain emanated from, deep within my arm, in the bone almost, but there was no scratch or bruise there. It was a precise pain, like I had hit my funny bone, doing what we were doing, that’s exactly what I thought happened. I was invited ashore, for lunch, by one of the office guys and by the end of it; I was noticeably nursing my elbow. The headache started around 2 pm, and by 4 pm I was in a sad state, and went right to bed. Looking back it seems silly to think the headaches and the precise pain in my elbow were not related, but at the time I thought I smack my elbow in some steel work, and after two weeks of long days working in the cool spring weather, headaches and sore throat were the beginnings of a cold. I needed a power nap. At 7 pm, I woke up rested and expecting to bounce out of bed, like usual. The brain was foggy, but the pain in my arm was now a significant concern. My elbow was hot, like burning hot to the touch. The skin was dry and the muscle in my forearm felt like that spongy stuff florist put flowers in to keep them in place, push a finger into the arm, and the muscles stayed that way for a long time, it was very strange. I wasn’t incapacitated or near death by any means, but I knew this was very unusual. After a bite to eat, and still no positive change, I decided to drive myself to the hospital nearby, around 9 pm. Expecting a four hour wait, like hospitals in BC, I was surprised to see the triage nurse right away, usher me into the emergency room. At this point the headache was not as bad as the sharp pain in my arm. One doctor came in, another had some more questions, they seem to be treating me with some intensity, but they seem to be missing what I was telling them, my arm felt like it was broken, and I wanted an x-ray, so I could confirm, a cast, and get out of there. Right away they gave me some oral antibiotics, and asked me to wait two hours, and then it was back in, to see the doctors. Clearly it was not working, I was getting worst, the pain, was significant and I was getting upset that they were not sending me for x-rays. Instead they said they were keeping me overnight and promptly put me on a gurney in the hallway, and administered a “strong” antibiotic intravenously, they told me they were treating me for an infection. With another dose of strong antibiotics in the morning completed, they sent me back to the ship, with instructions to come back later for another dose of antibiotics. Roughly 24 hrs had pass since I first noticed the pain. Back on the ship, my arm was now huge, like Popeye’s, but red and so hot to the touch. The spongy feel of the muscle was even more pronounced; but the headache was mild. I went back for another dose, and again they kept me overnight. By this time I had become somewhat of a minor celebrity – “oh, you’re the seafarer”. The doctors were a bit frustrating to deal with as they were just carrying on without telling me what was going on, but obviously, from the quick service and the attention I received, I could tell something was unusual. The next morning the emergency doctor summed up the case – I had an infection, with no obvious cause. They had called the disease specialist, which made me really worried, especially since she came to see me with four other doctors. She looked me over, and said that they suspected I had an MRSA infection, and none of the treatments usually assigned, were working. She had mentioned that this was fairly rare for them at that hospital. MRSA (CA), or Methicillin-resistant Staphylococcus aureus(Community acquired) is becoming a major scourge to health care providers because they are life threatening infections, with very few effective countermeasures. A few years earlier, a famous politician in the area, lost a leg to the “flesh eating disease”, which is related to this infection. This is a serious infection, and man, was I glad I was wrong about pursuing X-Rays – because this hospital was right on it, right away. Wikipedia has allot of information on this and was an enormous help in understanding what was happening at the time. As if often the case, when such a serious condition occurs, tales of similar encounters start coming out from friend and neighbours. One from my son’s teacher, who had just returned to teaching after a miss-diagnosed of MRSA in his back, put him out for a year. Another acquaintance, her husband lost the use of both legs and was now confined to a wheelchair. In their cases, the hospital in BC, had given them painkillers, and sent them home. 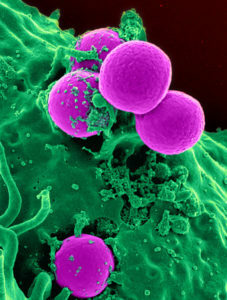 In my experience, I can tell you that MRSA moves very fast, any delays in treatment, are severe blows to your health. It was Friday and the ship was scheduled to leave Tuesday; we were wrestling with treatment options – was I going to be sent home to BC ASAP, or start treatment in Quebec City. The hospital in Quebec again surprised me, as in BC they shuffle you out the door ASAP, these guys undertook to administer treatment, keeping staff overtime, just for me to get this dose of very expensive antibiotic, which should have been my problem to pay for. Typically a run of antibiotics, 21 days or so, cost about 20 bucks in Canada, but each dose of this stuff was costing about $1000; and I need three of them. Right away, after the first dose, the pain was noticeably different, and the heat emanating from my arm was noticeably less. It really was amazing feat of pharmaceuticals and science. The next two days, the hospital arranged for me to receive my doses at a nearby clinic, since the hospital’s clinic was closed over the weekend. They also prescribed two additional types of strong antibiotics; when I picked up the prescription from a random pharmacy, “ahh, you’re the seafarer”, the pharmacist said – apparently I was a minor celebrity in the neighborhood. I was still on antibiotics when I signed off the ship a couple weeks later. After the first course, two more courses were needed before I finally was able to no longer feel a pain in my elbow. Although my muscle did not come back to normal for probably six months after the first time I felt pain. With all the stories I heard from others, I clearly I feel very fortunate to have been in the situation I was in; the ship alongside, a company vehicle nearby, an understanding boss, a top notch crew at the hospital. What is MRSA CA? As turns out it is becoming more and more prevalent “in the community”, as opposed to the “traditional” more common, health care setting acquired version. 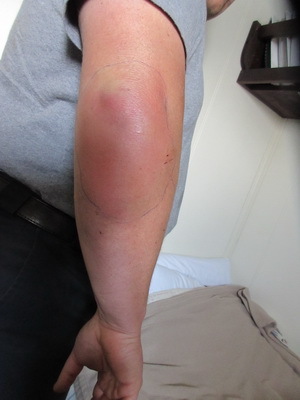 Seafarers in general, tick off many of the higher risk boxes for this infection, and should be particularly alert to its presence. Some of the factors in the development of this dangerous infection, is close quarters living, like prisons, barracks, or a ship. MRSA lives predominately in the nostrils area, and can live there for many years, without any affect to the carrier. Also coastal, humid climes present higher risk factors. Depressed immune system, stress are also risks factors. In retrospect, a dredge is almost perfect case where identifiable risk exists. I can tell you from this seafarer to another, don’t mess about with this stuff. It is life threatening and acts very fast, and quite randomly. I can only think of the problems I would have encountered being at sea instead of alongside. No need to panic, but be aware of your body and don’t ignore what’s it’s telling you. After this episode, I suggested to the rest of the crew, during a safety meeting, to be much more active in washing hands on-board, with placement of more alcohol based hand sanitizer dispensers, and generally be more vigilant with general hygiene. I also brought it up to the company to think about mitigation. Like all humans, we tend to gloss over the risks of our jobs, after all there are so many on-board, and I feel the crew and company are probably “not as alarmed” as I might want them to be when it comes to MRSA. The year after my bout with MRSA, I can still feel a faint something in my elbow, but I’ve otherwise fully recovered. Our superintendent came up to me the other day, “you remember when you had that bug last year, well guess what, I got it too”, he said. He too had a successful recovery, but you could tell by his tone, that he was now a bit different talking about it. I am very glad that it was a succesful recovery. It is very scary what can happen quickly onboard. Happened to me last spring, thought I had aggravated and old chip in my elbow and after a few days a friend who practiced physio insisted I step it up a notch. Seven days of intravenous on top of oral antibiotics followed by two weeks of more oral antibiotics. Very scary as I started to think about losing an arm.